In many buildings it is not possible to create openings above the fire. This can be the case, for example, where there is a fire in an industrial building with a lightweight concrete roof or in an apartment in an apartment block, where ventilation through existing windows or doors is the only possibility. So called horizontal ventilation is based on outlets at the same level as the fire. This normally creates no upward fl ow of the fire gases in the building, and the fire gases flows out horizontally through the outlets (normally windows or doors). Horizontal ventilation is normally implemented by using the building’s permanent openings (windows, doors or vents) to the greatest possible extent to vent out the fire gases. Openings occupying a high position on the leeward side should be used as outlets. Openings occupying a low position on the wind side should be used as inlets. In this way it is possible to utilise the thermal buoyancy force of the hot gases to the greatest possible extent, and also the pressure of the wind, to vent out the gases. If this does not work it will be necessary to consider which produces the largest pressure difference, the temperature of the hot gases or the wind. The effect of horizontal fire ventilation can be improved with the help of fans. This will be described in more detail further on. Horizontal fire ventilation means that the outlets are at the same level as the fire. This reduces the effect of the fire gases’ thermal buoyancy force, but is often the only way of venting, for example in the case of apartment fires. Vertical fire ventilation of rooms exposed to fire Vertical fire ventilation means that the outlets are above the fire, often as high up as possible in the building. The smoke then flows out vertically, i.e. upwards, from the fire or from the fire room and out through the outlets. The inlets on the other hand should, as described above, be on a level with or below the fire. High outlets are normally implemented by making an opening in the roof structure, or also by using existing hatches (windows/apertures or vents/shutters). Basement fires can often cause a problem, where outlets can be arranged above the fire, but where inlets also have to be arranged above the fire. In this situation it is especially important to make use of the wind or to use fans. In certain cases it may be necessary to use the same opening for both the supply and exhaust air. 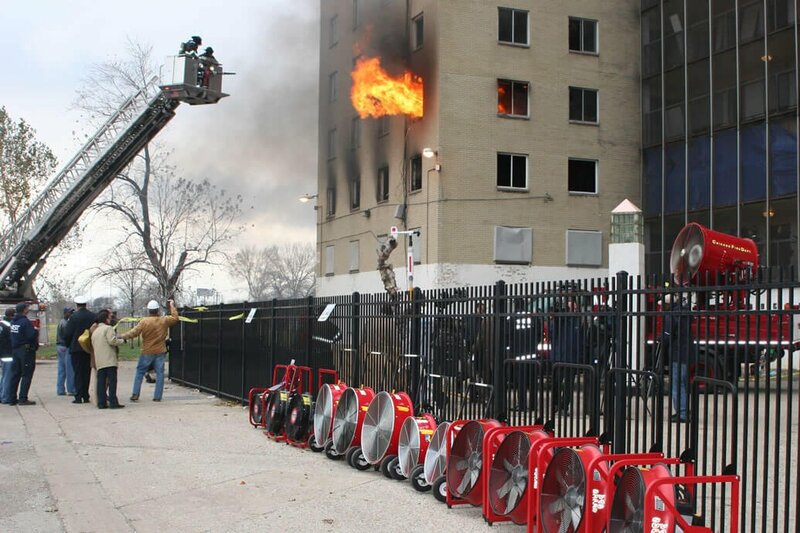 The effect of vertical fire ventilation can be improved with the help of fans. This will be described in more detail further on. Vertical fire ventilation means that the outlets/inlets are above the fire, often as high up as possible in the building. In this way it is possible to utilise the thermal buoyancy force of the hot gases. When a fire in one room is fully developed it can be more appropriate to implement fire ventilation in adjoining rooms than to vent the room where the fire is burning. The purpose of this is to prevent the spread of the fire and hot gases to non exposed rooms (e.g. adjoining fire cells). Fire ventilation of adjacent rooms is normally implemented as the pressurising of these rooms (see below) or by creating openings in the roof. The openings can then be made as a trench, i.e. the physical separation of the roof between the part that is burning and the part of the building that is not yet damaged. These openings can, however, be made both horizontally and vertically, and can also be combined with mechanical ventilation. Mechanical ventilation can be implemented by using fans. Negative pressure ventilation means that fire gases is sucked out from the fire room or from adjacent rooms. Positive pressure ventilation (PPV) means that air is pressed into a room exposed to fire with the help of fans, in combination with a swift fire attack. It is also possible to pressurise adjacent rooms. There is often very little to distinguish the pressurising of adjacent rooms from positive pressure ventilation: for example, when implementing positive pressure ventilation in the case of an apartment fire it is also possible to achieve the effect of pressurising the stairwell. It is also possible to implement various types of positive pressure ventilation. Mechanical ventilation must be combined with creating openings, so as to achieve horizontal or vertical ventilation (i.e. so that both inlets and outlets are achieved).